Place potato in a medium saucepan; add water to cover. Bring to a boil. Reduce heat; cook, uncovered, until tender, 8-10 minutes. Drain potatoes; return to pan. Mash until very smooth. In a large bowl, dissolve yeast in warm water. Add milk, butter, potatoes, eggs and, if desired, extract. Add sugar, salt, cinnamon and 3 cups flour. Beat until smooth. Stir in enough remaining flour to form a soft dough. Cover and let rise in a warm place until doubled, about 1 hour. Stir down dough. On a well-floured surface, roll out to 1/2-in. thickness. Cut with a floured 2-1/2-in. doughnut cutter. Place on greased baking sheets; cover and let rise for 45 minutes. Meanwhile, for glaze, combine 6 tablespoons milk, coffee and vanilla; stir to dissolve coffee. In a large bowl, beat butter, sugar, cinnamon and salt. Gradually add milk mixture; beat until smooth, adding milk to reach a good dipping consistency. In an electric skillet or deep-fat fryer, heat oil to 375°. 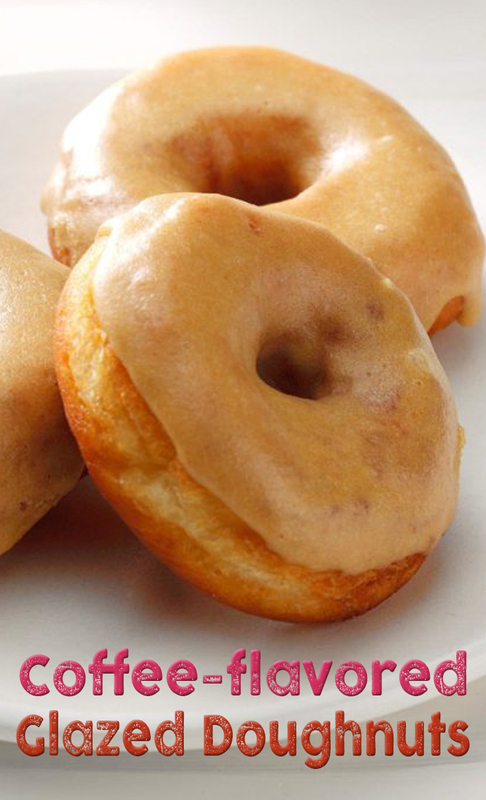 Fry doughnuts, a few at a time, about 1-1/2 minutes per side or until golden. Drain on paper towels. Dip tops in glaze while warm.